The low profile LABS Series is designed to provide near LN2 temperatures at the top of the Inventory System and all racks are in vapor. They can also be used in full liquid storage. The LABS Series features the intuitive Kryos Control. Every LABS model is backed by a 3 year warranty when purchased from L&G Cryogenics. *Hinged & Lockable Lid - (With Sealed Coating) For added security and safety to samples. Pricing for the K Series and Labs Series vary due to fluctuating costs of steel. Also, L&G can give greater discounts on these units depending on your needs and the number of units you require. Contact us to receive your personalized quote. 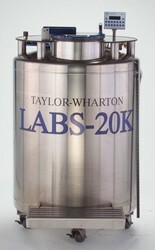 The Taylor Wharton LABS 20K LN2 System is the perfect cryogenic storage solution when you require storage capacities of up to 19,500 2ml vials. This unit features an easy-grip, aluminum turn-table for easier movement, a flat table top providing a convenient work surface and a hinged and lockable lid with a sealed coating for long-lasting LN2 temperatures. We offer a large variety of inventory systems and accessories making this unit complete. Max Gross Weight: 1,375 lbs. The Taylor Wharton LABS 38K LN2 System is the perfect cryogenic storage solution when you require storage capacities of up to 37,700 2ml vials. This unit features an easy-grip, aluminum turn-table for easier movement, a flat table top providing a convenient work surface and a hinged and lockable lid with a sealed coating for long-lasting LN2 temperatures. We offer a large variety of inventory systems and accessories making this unit complete. Max Gross Weight: 2,050 lbs. 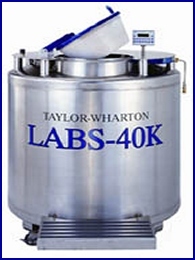 The Taylor Wharton LABS 40K LN2 System is the perfect cryogenic storage solution when you require storage capacities of up to 41,600 2ml vials. This unit features an easy-grip, aluminum turn-table for easier movement, a flat table top providing a convenient work surface and a hinged and lockable lid with a sealed coating for long-lasting LN2 temperatures. We offer a large variety of inventory systems and accessories making this unit complete. Max Gross Weight: 2,000 lbs. 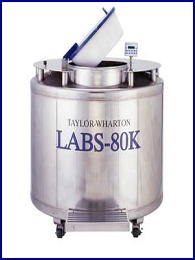 The Taylor Wharton LABS 80K LN2 System is the perfect cryogenic storage solution when you require storage capacities of up to 79,300 2ml vials. This unit features an easy-grip, aluminum turn-table for easier movement, a flat table top providing a convenient work surface and a hinged and lockable lid with a sealed coating for long-lasting LN2 temperatures. We offer a large variety of inventory systems and accessories making this unit complete. Max Gross Weight: 3,956 lbs. 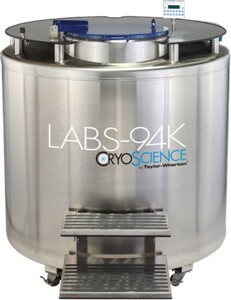 The Taylor Wharton LABS 94K LN2 System is the perfect cryogenic storage solution when you require storage capacities of up to 94,500 2ml vials. This unit features an easy-grip, aluminum turn-table for easier movement, a flat table top providing a convenient work surface and a hinged and lockable lid with a sealed coating for long-lasting LN2 temperatures. We offer a large variety of inventory systems and accessories making this unit complete. Integrated single stainless steel folding step. Max Gross Weight: 4,600 lbs.